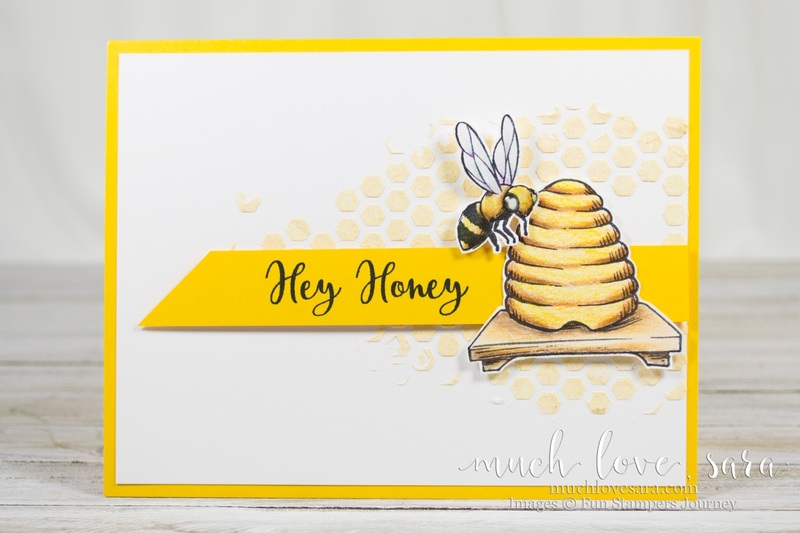 Saturday was the first day for our new 2017-2018 catalog, and my Fun Stampers Journey team had an open house here in the Boise area to kick off this fun new catalog. 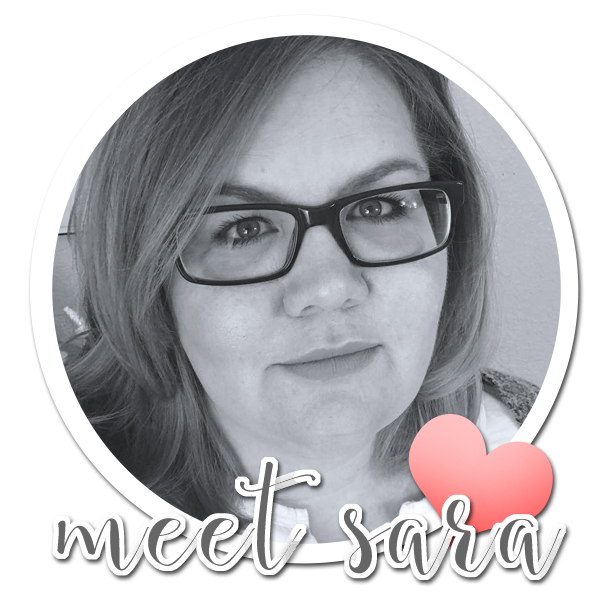 There were so many incredible displays, and fun products to play with. We had the Color Burst and Color Splash Pencils out, so customers could play with them and some blending solution. We had Pan Pastels out, Color Splashes, Silks, a make and take where they could use the Platinum Die Cutting Machine and more. 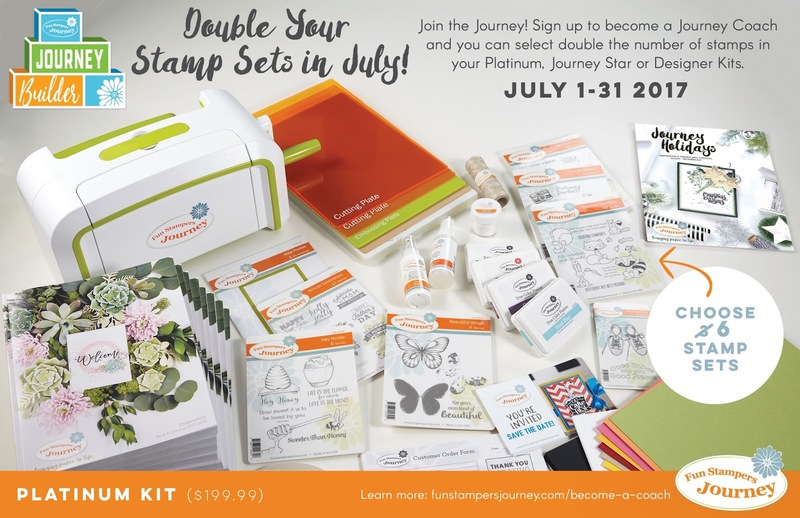 There was even a room set up with the Starter kit so you could see just what was included (July is DOUBLE stamps! Be sure to read my "PS" at the bottom of this post.). It was a blast, and there were so many people. I had a few items I'd made out for display, and I cannot count the number of times I heard my name called, as people wanted an explanation of how to recreate the items. 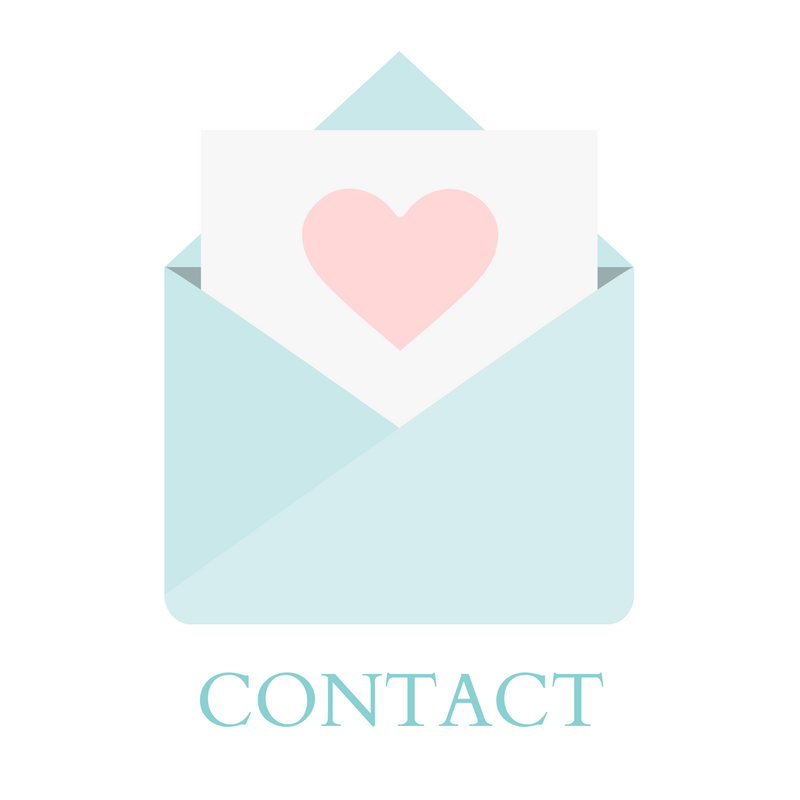 Lucky for you who read this, I'm going to explain it here over the next few posts! 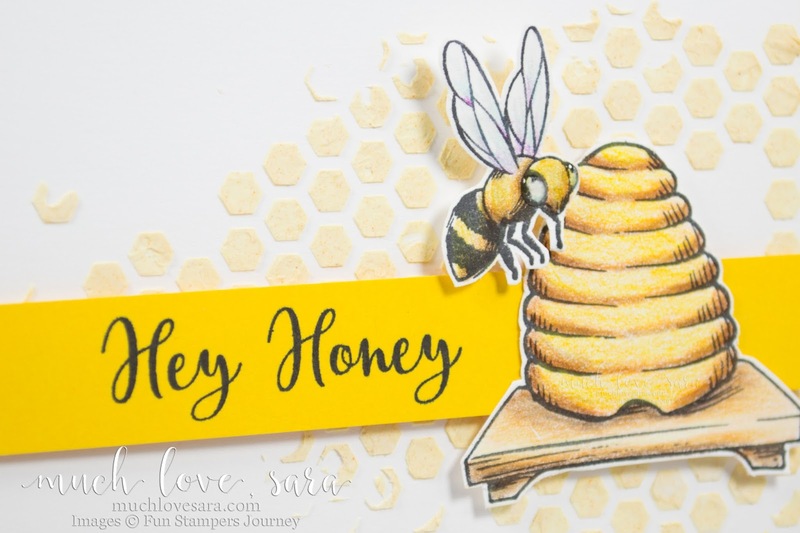 I used the Hey Honey stamp set, so of course I had to make a card just dripping with "honey". I stamped and colored my images on a Whip Cream card front. To create the honey, I poured a small amount of Journey Glaze into a paper cup, and added a few drops of reinkers. I used mostly Summer Days, but did add a couple of drops of Banana. 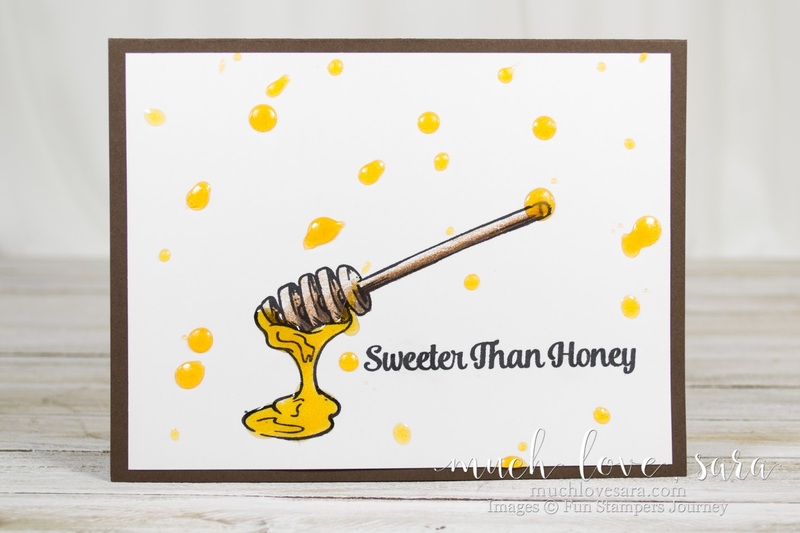 I mixed that together using a popcicle stick, and then dripped it right onto my card front. Where the honey was flowing off the honey stick, I simply used the popsicle stick to guide the colored glaze within the lines. Once the "honey" dried, I added my card front to a Cocoa Powder card base. Using a similar idea, I colored some modeling past for the second card. I took a small amount of paste and put it down on a nonporous work surface. I mixed in my reinker, and then used the colored paste with the Vintage Screen stencil to create a "honeycomb" background for my sentiment banner and colored images. If you don't have a reinker, you can press your ink pad against a nonporous surface, and then mix your paste or glaze on top of that. You just won't get quite as intense of color. Both techniques offer a fun texture to these cards, and are easy and fun to do. Tomorrow is Independence Day, so have a safe and happy holiday, and I'll see you back here on Wednesday!